2009 - My first summer here. I started my job here on May 18, a week before Summer Reading started. Just making it through the summer was my ONLY goal for that first summer. 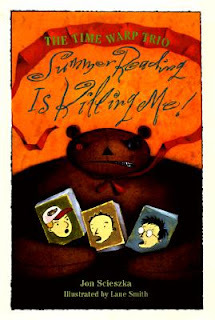 2010 - This was my first summer actually being in charge of planning an entire Summer Reading Club. I was determined to get our numbers up, and I was determined to rectify some things from the previous summer. We'd had long waitlists for each of our programs and unhappy patrons when we didn't have room for them. So we doubled up on sessions, made strict registration start dates, and offered more programs. Yeah, we were way overprogrammed. 2011 - I started to get smart this summer by offering more unstructured programs that didn't need as much staff prep time and could accommodate larger groups. This was the summer we started a weekly movie matinee and changed from our Friday "Crafternoons" to Friday "Open Art Studios". These changes were helpful, but this is the summer that I was very involved in the teen programming, due to some staffing changes. It was way too much for me to handle. Honestly, going in to the summer I felt woefully unprepared. I was involved in the search for our new teen librarian in the spring and I had some committee duties that kept my attention divided. And we've had a pretty big increase (over 10%) in our signups this summer! By all accounts, I should be stressed out to the max, but I'm actually doing okay. What it boils down to is that I think I've found a nice balance to the programming we're offering. It seems to be enough to keep patrons happy and engaged, but not so much that we're all pulling our hair out. While our Summer Reading Club spans 10 weeks of the summer, we only really offered programming for 6 of those weeks. We had no programs and awarded no prizes for the first two weeks of SRC so that we could concentrate on getting kids registered. The bulk of our registrations typically happen within the first two weeks, so being program-free means we can all be out at the desks helping our patrons and getting them signed up. We also had no programs the last week of SRC so that we could concentrate on awarding prizes to the finishers who are coming in droves. And we took a break from most of our programming during the week of July 4. We still offered our "easy" programs - our movie matinee and our weekly art studio. Having a week "off" in the middle of the summer gives us all a chance to breathe. I moved our largest attended program (a live animal show) to July when we typically have slower program attendance. That helped us keep this uber-popular program manageable and attracted a nice crowd when typically it's quieter in July. I moved our Open Art Studio program to Saturday in an effort to keep Fridays program-free and to offer some programming that working parents could attend. We did have a couple of programs on Fridays, but for the most part it was really nice to have one day a week that we could recoup and work on other things like book orders, planning for the fall, staff meetings, etc. I distributed programs as easily as I could between my staff. I'm very lucky to have an awesome staff in this department and this year I truly made an effort to balance everyone's load. And although we all had tons of ideas for programs, I was able to limit what we were offering to make it manageable. It always sounds like a great idea to me to offer hundreds of programs - we'll have so much fun with the kids! - but then when it comes time to actually do the programs, I end up overextended and miserable. We were not involved in teen programming (except for a couple of special programs in which my staff partnered with our new teen librarian). We continued to offer weekly movie matinees and weekly art studios. By offering drop-in programs for all ages, there's always SOMETHING to offer patrons who call up, even if the registered programs they're asking about are full. I took some time at the very beginning of the summer to work on planning the rest of the year's programs. Oh, I didn't actually plan what we'd be offering, but I looked at the calendar for the rest of 2012 and 2013 and mapped out when we would offer fall and spring storytime, when school breaks are happening, and dates for our major annual programs like the Gingerbread House Workshop and the Egg Decorating Workshop. I then took those plans and worked backwards to set planning deadlines for myself so that next summer I will hopefully feel more on top of things. I started with next year's Summer Reading Club starting date and figured out when we'd need to have program calendars ready, when we'd need to finalize program plans, when we'd need to start brainstorming program ideas, when we needed to put in orders with Upstart and Oriental Trading for supplies and prizes... I scheduled monthly department meetings and jotted down notes about what we'd need to cover at each meeting to make our planning process smooth. Now, when I'm working on agendas for those meetings, I know what big-picture stuff we need to tackle in addition to whatever more recent or urgent developments we need to talk about. All of the changes we made this summer and limiting the number of programs we're offering really worked to lessen my staff's stress levels. I'm hopeful that we've finally found a happy balance that we can work from next year to make next year go as smoothly as this year. Of course, we'll always be looking for ways to make planning and running the Summer Reading Club even easier. Do you have any tips to share? What has worked for you?